A true country pub bursting with character, Merlin’s Cave rests in the proud centre of Chalfont St Giles village green. 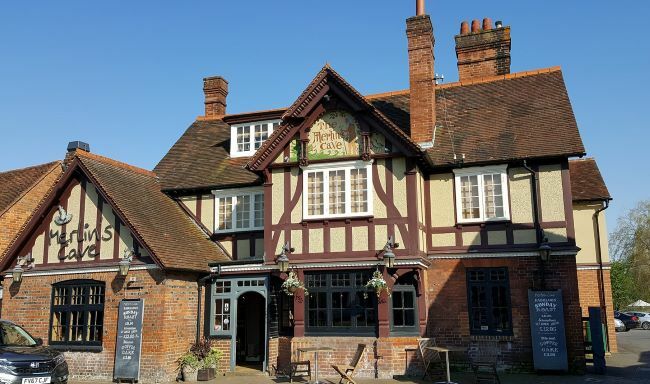 With our picturesque pub garden bordered by the river Misbourne & Chalfont St Giles parish church, our small but bustling bar & fresh food menu filled with homely comforts, we are the perfect place to relax, rejuvenate & recharge. Rest assured, at Merlin’s Cave there is always a place for you in our home. Bring your partner, your parents, your friends, your children, your pup, and you will always be welcomed with open arms & a warm smile! had a lovely meal with friends at Merlin's cave last night. Food was excellent and the service was second to none!!!! Definitely visiting again! We were very well looked after by the staff. Service yesterday was extremely slow despite the pub not being very busy we had to wait for food and drinks and chase things all the time. Large party of 18. Service was attentive, friendly and relaxed. Food came out all at the same time which is no mean feat for a large party. Food was all of a reasonable/good standard. Would certainly recommend for a large party. Came for Sunday dinner and it was A-MAZ-ING!!! If i were to be picky I'd of hoped for some stuffing but overall I can't complain and I'll be back for Sunday dinner again and during the week to try the other menu! Service was quite slow and the staff seemed a bit miserable. The food was good. First class service, great food and reasonable price. Spent Mothering Sunday afternoon with family here. Staff were very pleasant and attentive. Food was excellent and a lovely relaxed atmosphere. Would highly recommend to anybody. Place was half empty but still items were unavailable on the (short ish) menu. Food was OK but some basic errors (my main not that hot, wife’s fish and chips a bit over cooked and dry. Wouldnt recommend based on this. Great venue for Birthday celebrations staff helpful and attentive. Both starters we had were very nice. However our main courses were not very good, especially the braised beef pie that I had. To call it a pie was very debatable, basically it was a slab of very stringy braised beef with a piece of not very nice pastry placed on the top. Underneath the meat there was a small amount of congealed gravy. This was the worst meal I have had in a restaurant for a long time. Thank you for your attentive service, one of our party is disabled and great attention was paid to her needs. We had a thoroughly lovely evening. Had a booking at 2.45pm and we ordered the boxes Camembert as a starter it arrived shrivelled and flat like it was old! We were then told at that point they had run out of nut roast (I’m a veggie) and heard the waiter tell the table next to us they had run out of roast beef too (what my partner wanted) for mains.... not what you expect when you go for a Sunday roast! Food arrived and it was warm and very average so not worth the value at all.... very disappointing! 5 diners - 3 meals arrived together then a 10 min wait for the remaining 2. Drinks chased up twice, my husband went to ask a 3rd time and they were on a tray on the bar. 4 staff chatting st the till. Staff need more training, or just have some common sense. Lack of management. I would not recommend eating at Merlins cave . It is run really, really  badly. We were really disappointed by the service last night. It took really ages to be directed to our table as there was no one available. Once seated we waited 20 minutes for someone to take our food order and finally my husband lost his pacience and went looking for someone around the kitchen to take our order. The table was not cleared of used plates from starters and the empty bottle of wine stayed the whole evening on the table, even after we ordered more wine. Not enough staff. Really disappointed with our dinner experience celebrating my son’s birthday. Would not recommend to anyone. Great choice of food and drink. The quality and quantity of the food was good. It was quiet at the time we went which was fine. The service throughout the meal was very good. I would recommend to friends. The Merlin’s Cave is situated in the centre of the attractive old village of Chalfont St Giles, and being adjacent to the lovely valley along which the Misbourne runs, is in an ideal location. The pub also has a good beer garden and children’s play area. Lunch here, however, was a mixed experience. On the positive side the food was good, and my pint of Bombardier went down very well; indeed, I was tempted to have the second pint that appeared which I hadn’t ordered! The young staff were extremely busy, mainly with many young mothers with their children presumably off school for the day because of the snow, but coped well, and were courteous and friendly throughout. My reservations: the area where we sat was dreadfully cold- I wore my winter coat throughout, and the radiator by me wasn’t on despite the snow outside. The tiny heater in its stead was of slight benefit only. The chair on which I sat was tatty as were several others around me, and my companion noticed that some in the eclectic mix of them must have originated from a church, given they had hymn book holders on their backs. Indeed an odd selection. I thought the food expensive for the quantity provided, and the service of the dessert was very slow. This was not helped by the fact that what I sought from the menu I was told only some time later wasn’t available. When I went to pay there was an item on it I hadn’t ordered (two glasses of wine), although that was corrected immediately I queried it- this was human error, nothing more. OK for young families, but I won't rush back. A nice averagely priced pub meal experience. Friendly staff and pleasant if not very adventurous menu.